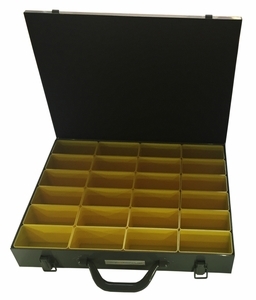 Intoducing the NEW Metal Parts Box with 24 Removable Bin Boxes. Boxes feature strong, rigid, cold rolled steel and heavy-duty welded construction. Grey powder coating. Full-length piano hinged covers are designed to stay open for ease of access. Each box has a carrying handle and two positive pull-down locking clasps. The box comes with 24 removable polypropylene bins.